It’s BACK! Give Local, the online-giving challenge, has returned for Round #2 but this time it is nation-wide! 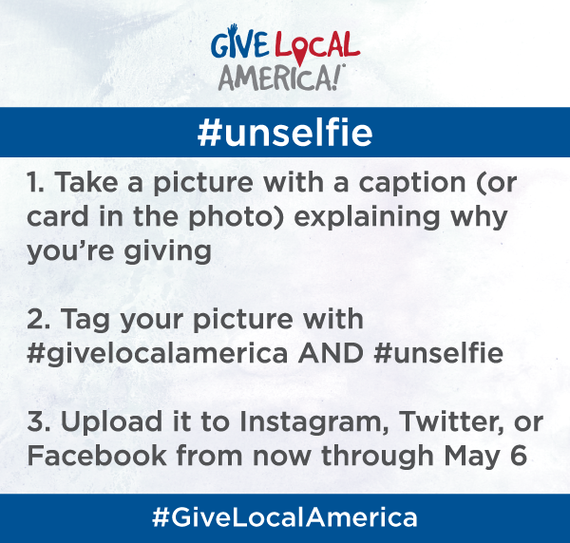 Give Local America kicks off on Tuesday, May 6th and runs for just 24 hours – ending at noon on May 7th! This opportunity is very important for our job training and job placement programs as every gift will be amplified with matching dollars from national and local funds donated by the Connecticut Community Foundation. Consider making your annual contribution during this event because every dollar is essentially worth more. Be Social! Tell your friends and family & spread the word about our participation in this event through social media. We will be sending out e-newsletters and posting on our Twitter and Facebook pages in the days leading up to and during the challenge. Attention all CT foodies and supporters of Community Culinary School alike! Our 8th annual gala is coming to town! Bon Appétit! will be our largest culinary event of the year and it will be held on March 15th, 2014 from 5:30pm-8:30pm. Unlike recent years, we are bringing this event back to our hometown and we are very excited! The event will be held in Steele Hall at Canterbury School on Aspetuck Avenue in New Milford. All proceeds from this event will go towards funding our job training and job placement programs. All THREE spin classes were filled up! 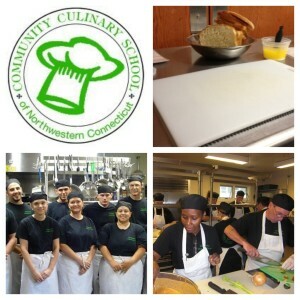 The COMMUNITY CULINARY SCHOOL OF NORTHWESTERN CT has been invited to participate in the GIVE LOCAL fundraising challenge sponsored by the Connecticut Community Foundation. Every penny of every dollar you donate online during this challenge will go directly towards supporting the work of the school and CCF will amplify your donation! The Challenge spans only 36 hours! *Note: All food prepared by the culinary students under the direction of Chef Instructor, Chef Blythe Roberts.November 13:Lunch (FREE FOR GIVE LOCAL DONORS):Our FAMOUS Southwest Corn Chowder, Bronco-Bustin Chili, Fresh Baked Biscuits, and Fresh baked cookies. The Final Hour to Give Local! Wine and Treats will be served. Feel free to come by anytime throughout Give Local for cookies and coffee. Bring friends! Taste of New Milford on September 11, 2013. Proceeds benefit the Community Culinary School. 2013 Quad-Am Golf Classic on September 9th, 2013. Hosted by Yardapes landscaping firm. All proceeds benefit the Culinary School. Click here for more information. June 29, 2013 7:00 pm The Great Kent Mexican Fiesta …because Cinco de Mayo is never enough! The Villager Restaurant, Kent CT $25.00 per person For reservations please call or email: Jeff Kilberg — (203) 770-4234 or JKilberg@ntins.com Dawn Hammacott — (203) 512-5791 or dawnhamm@sbcglobal.net Ellen Corsell — (860) 927-4804 B.Y.O.B. music & dancing & drawings & loads of happy faces See you there!! Missed an event? Please consider a donation. 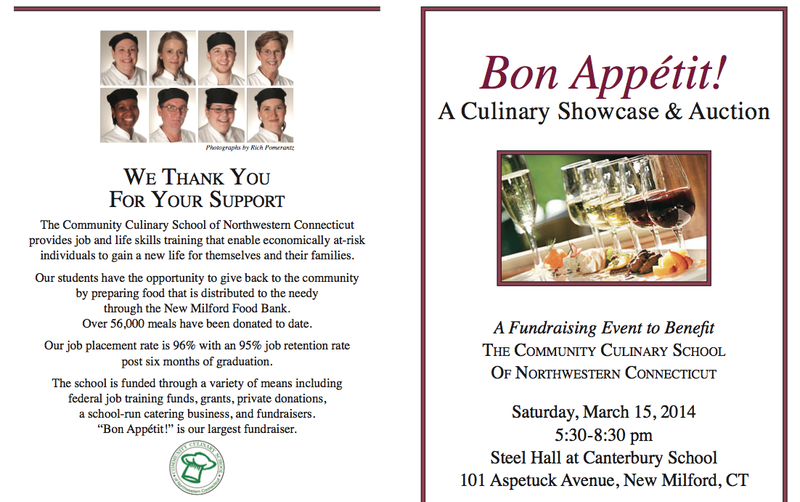 If you were unable to attend our events, but wish to make a contribution in support of the Community Culinary School of Northwestern Connecticut, you may do so here. We appreciate donations in any amount and thank you for your support!